While we’ve gone through the Yankees’ key offensive and defensive contributors this season, they had plenty of part-time players that made smaller but memorable impacts. Here’s a look at the 2018 season for Tyler Austin, Ronald Torreyes, Tyler Wade and Adeiny Hechavarria, the primary backup infielders. 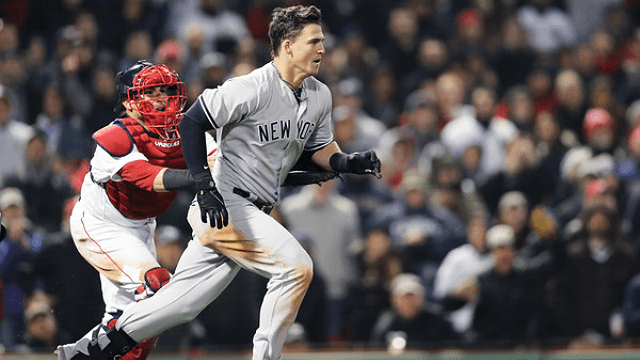 It’s easy to forget, but Tyler Austin was the Yankees’ Opening Day first baseman. Look it up! He batted ninth and struck out once. However, thanks to the constant injuries to Greg Bird and the early-season struggles of Neil Walker, Austin earned himself a long look at first base. Beginning with the third game of the year, where Austin slugged a pair of homers off Marco Estrada, the right-handed first baseman tore up April. He hit five home runs and had seven multi-hit games, slugging .629 for the month. However, Austin went 0-for-3 on April 26 and had to serve a four-game suspension. Why? Because of the epic brawl started with his fight against Joe Kelly on April 11. Austin’s hard slide into second base caused a fracas earlier in the game and Joe Kelly throwing at him had tension boil over. Your browser does not support iframes. Starting with his final at-bat on April 25 and ending on May 15, Austin went 0-for-23 with one walk and 12 strikeouts, cooling off significantly. He recovered with three straight two-hit games, including a two-homer game against the Royals, but he was demoted soon after thanks to Bird’s return. While Austin finally achieved a healthy season in pinstripes, he would only play four more games after May. He would be traded along with MiLBer Luis Rio for Lance Lynn on July 30 after the Yankees acquired Luke Voit. Austin would go 1-for-4 with a walk in lone game vs. Yankees after the trade. In all, Austin hit a respectable .223/.280/.471 (98 OPS+) with the Yankees in 2018, though his on-base percentage and 40 percent strikeout rate wouldn’t be palatable long-term. Joe Mauer’s retirement in Minnesota gives him a chance to play more first base, particularly after he had another home run binge after the trade. However, C.J. Cron’s acquisition makes it harder to find playing time. Like Austin and Wade, Torreyes found himself the recipient of some early starts in the Bronx in 2018. Toe earned the chance to take over second base with Wade struggling early. He put up three three-hit games in April, including one against the Orioles on April 7. However, Torreyes’ playing time quickly dried up once Gleyber Torres was called up. This happened despite Torreyes having a nine-game hitting streak and batting .410 until his last game in April. Once Torres and Miguel Andujar took off by the end of April, it was all but over for Torreyes in the Bronx. With those two young players surrounding Didi Gregorius, the Yankees had three guys playing practically every day at Torreyes’ three positions. Toe would start just six times in May before he was sent down. He came up for two games in June and then didn’t get significant playing time until Didi went on the shelf in August. In the game Didi was injured at first base, Torreyes had a three-hit game off the bench. Torreyes had just 102 plate appearances in 41 games this year, batting .280/.294/.370 in sporadic playing appearances. That led to his designation for assignment this week to make room for Parker Bridwell. Hopefully, Toe will find a new start in Chicago after being dealt to the Cubs. It was a real bummer of a season for Wade, who had a prime opportunity at second base before Torres’ call-up. In his age-23 season, Wade couldn’t crack a .500 OPS. over 70 plate appearances, batting just .167/.214/.273 (31 OPS+), which was actually an improvement over his cameo in 2017. In nine April starts, Wade hit in just three games. He came through with big hits in the second game of the year, knocking in the game-winning runs in the middle innings. However, his inability to get the ball out of the infield led to his demotion once Torres came up. Wade wasn’t back up until July. He had his first career homer against the Orioles while notching his first three-hit game. He had five hits over consecutive starts with two-hit game vs. Indians. Those games knocked his line from .103/.167/.154 to .188/.235/.333. giving him a season-best .569 OPS. He was only a pinch runner or defensive replacement in September, scoring two runs and stealing one base in only his attempt. Wade also took a step back in hitting at Triple-A in 2018, so confidence in the former prospect has to be at a low. He’s still just 24, but the idea that he can be the Yankees’ Ben Zobrist or Marwin Gonzalez seems out the window until proven otherwise. Shortly after the Andrew McCutchen trade, the Yankees acquired Hechavarria from the Pirates just in time to get him eligible for the postseason. The Bombers were Hech’s third team of 2018 (Rays) and fourth team in two years. Hechavarria was essentially acquired just for defensive replacement value. He had exclusively played shortstop since his rookie season and was thrust into that role initially as the Yankees waited for Didi to get healthy. However, Hechavarria was brought in to take over as a defensive replacement for Andujar on a regular basis down the stretch. Though he hit just .194 with a .216 OBP in the Bronx, he had a couple signature offensive moments. He hit an insurance run homer against the Athletics just after Labor Day and a go-ahead homer against the Rays on Sept. 25th. Still, he had a 51 wRC+ in 37 PAs and 18 games. He made one throwing error in the regular season and a couple misplays, but he was a clear step up from Andujar with his smooth glove in the field. Hechavarria played in four playoff games, relieving Andujar in the sixth inning (!) of the Wild Card Game. He made a dazzling leaping catch as the Yankees pulled away. ?Your browser does not support iframes. He also replaced Andujar in the sixth inning of ALDS Game 2. While he can certainly field, it said more about Andujar’s ineptitude than Hechavarria’s talent. Now a free agent, he’ll likely be elsewhere next year, though Didi’s injury creates an opening at short. He can’t hit well enough to deserve that spot on a regular basis to begin the year but could be good insurance in the minors.